It has been all about BIG RED FISH this winter. 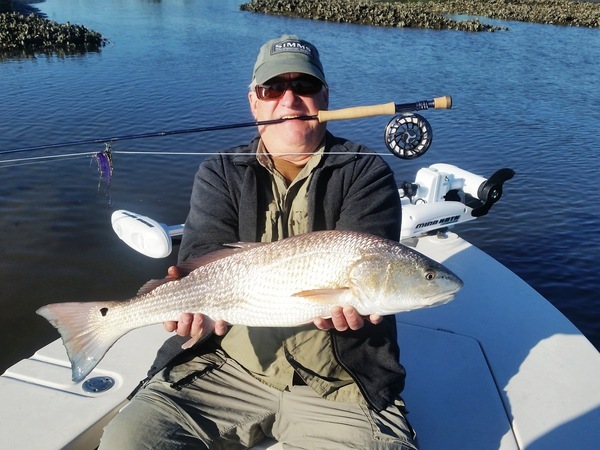 January, February and March offered some of the best red fishing of the year. The trip to Ascension Bay did not make for April. I have reserved February 11-18, 2017 for next year. This will be one week of some of the best fly fishing in the world. Call me. Only 7 spots left. On days after the cold weather, when the water warmed up a few degrees, sight fishing was fabulous. Troy is a local who fished with me a few days. We were rewarded with schools of reds moving up and down the banks, pushing water and chasing shrimp. With the clear water, sight fishing was terrific. Later in Spring, the fish were cruising on the flats and eating well presented flies. 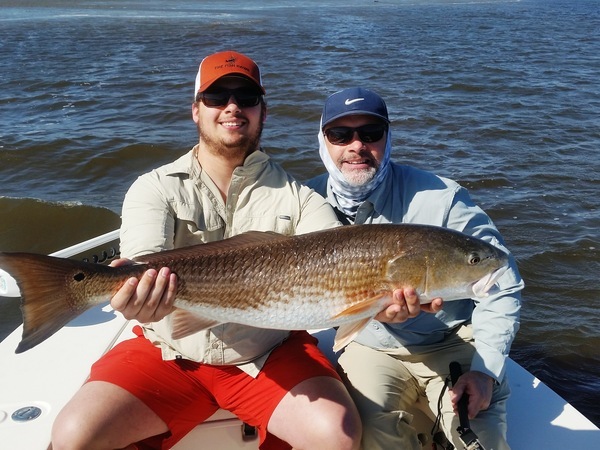 Frank was recently rewarded with this 10 lb 29" red fish, while Jack caught this 11 lb, 30" bruiser. 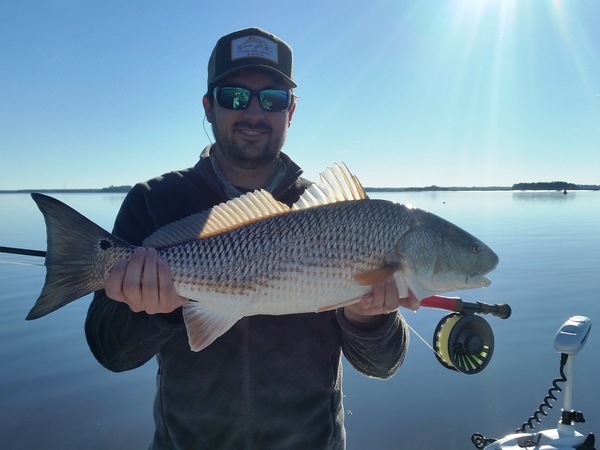 The one thing that is a constant in clear water fishing is the farther you can cast with accuracy, the greater chance you have of catching these spooky reds. If I have to pole you within 30-40 ft. of these red fish, they see us and spook. Also, false casting excessively spooks the school. See the tips and techniques section for some casting tips to increase your chances. March brings warming water. With the water temperature at 70 degrees on some days recently, the triple tail should be here soon. We have had strong east and NE winds the past few days, but as soon as the wind calms down and I can safely get into the ocean in front of Jekyll, we will begin the annual ritual of chasing free floating triple tail. 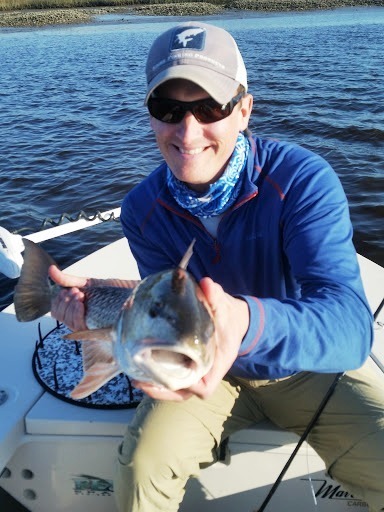 Additionally, the warmer waters means tailing red fish. If you are down here on a full or new moon, by all means call me and see if we can go out for a quick trip. 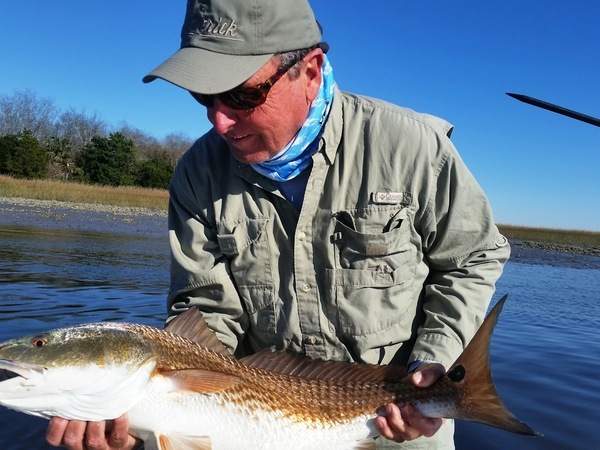 Tailing red fish in the grass is the classic, Southern way to fly fish for our red fish. There aren't many things more exciting than casting to a 10 lb red in 10 inches of water with his tail waving in the air. So here we go again. 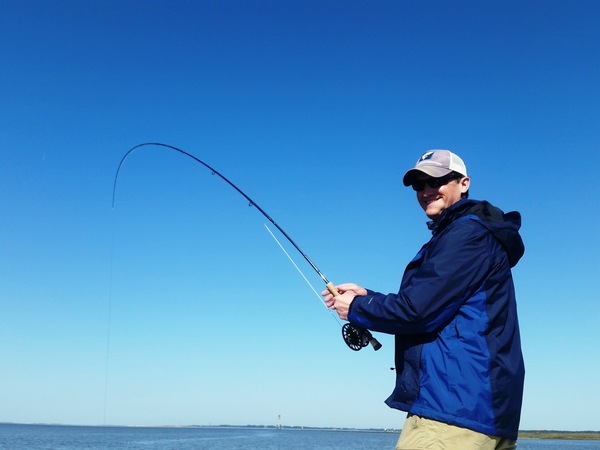 I am in my seventh year of guiding fly fishers in St. Simons. I can't believe how time has flown by. Thanks to all who have fished with me over the years. I look forward to renewing friendships and making new ones this year. Wind. It is the curse of fly fishers everywhere. It is even more of a curse when fishing for shallow water red fish on mud flats. The wind stirs up the water and makes it muddy. One of the biggest challenges we have is getting the fly where the fish can see it. That challenge is ever greater when the water is stained or muddy. I have been trying to figure out how to tie a fly that pushes water, has the right colors for stained water, is big and flashy enough for the red fish to see it. Dark colors and contrast work the best in stained waters. In designing the "Mop" I wanted a fly that met all these critera. The "Mop" is tied on a regular shank 2/0 hook with medium dumbell eyes. Tying it is simple. Tie in a Black zonker strip for a tail. In front of the tail, palmer a chartreuse marabou feather. For the head, make a dubbing loop about 6" long. Take purple Puglisi fibers. Cut some in half and some in thirds. Place them along the loop, and palmer them to the back of the eyes. Pick out the trapped fibers as you are wrapping the loop. Tie off, pick out the rest of trapped fibers. Then tie in about 12 strands of gold flashabou on either side. The whole fly is about 6" long when finished. The "Mop" is big, flashy, has movemen, contrast, and has been catching fish in dirty water this week. A fly this big needs to be thrown by a heavier fly rod. Pull out the 9, or even the 10 weight. It will make tossing the "Mop" much more enjoyable. Tie up a few, and see if they work for you. Spring means warming weather and water. 70 degrees seems to be the magic number when the triple tail return and the red fish start tailing in the grass. Trout fishing begins to pick up as well. 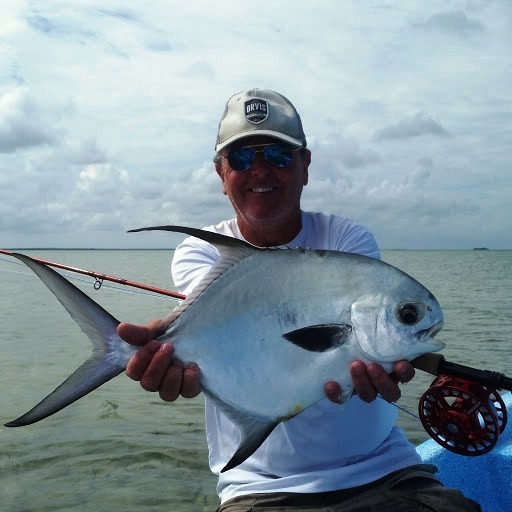 The Triple Tail fishery is a fishery that is unique to our area. The TT arrive the end of March/first of April and free float in front of Jekyll Island. Fishing for the is simple. We idle around in front of Jekyll looking for what appears to be a trash bag floating in the water. I get close, put trolling motor down to get you into fly casting range. If you put the fly in front of them, they may or may not eat. But that is fishing. When they eat, you will be rewarded with jumps and hard runs. I try to make as many trips at this time of year combo trips for Reds and TT. Give me a call to experience this unique fishery.